So, after a few days I decided to check on my VeggiePro with the chili peppers. When I looked inside the tub of water, I realized that the water was completely stagnant. You know what that means. Stagnant water means that there's no oxygen going through the nutrient water, which means that plants (like you and me) can suffocate. Worse, stagnant water can promote growth of bacteria, which aside from being icky can further take oxygen away from the growing plants. Now, I have become somewhat of an expert at replacing the Aerogarden pump in my old Aerogarden 7. But with the 6-unit Aerogarden, it didn't use a pump--it blows air through a small white plastic hole in the bottom of the unit into a plastic tube, and then out through a rock hard green bubble-making thing. Turns out the hard green bubble-making thing is called an "Airstone". And it turns out mine was completely blocked. Not sure exactly what was blocking it--it could have been nutrients from when I grew the tomatoes, it could have been plant roots, and it could have been gunk. I took the plastic tubing out and sanitized it, and then for kicks, I tried blowing into the clean end and seeing what would happen. After blowing and blowing, I saw little bubbles come out of the airstone. Obviously the best days of this airstone were behind it, but at least I could get a few more bubbles out of this. 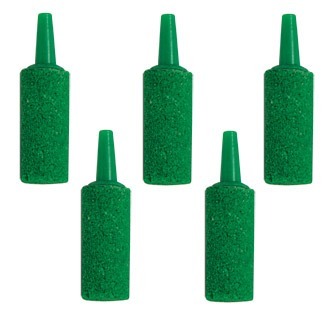 the 5 Pack of new Airstones . I actually wanted to get the free shipping (by spending $50) by stocking up with the multi-packs of new grow lights, a new black replacement arm, and the big bottle of liquid nutrients, but to my dismay most of them were out of stock (and have been for months). So I ended up paying $7.95 for the airstones and $5.95 for shipping (grrr). Come on Aerogarden! Anyway, I should get my new airstones in a few days, during which time I'll flush the water out and refresh the chili with clear water and good oxygen. Hopefully this period of time when they're not as well aerated will not stunt their growth too much. Note: since writing this post, I found that Aerogarden provides instructions on how to clean the airstone. Wish I'd found that before forking over the $14. Oh well, the procedure looks pretty painstaking, so I guess I'm better off anyway just paying for new clean ones.